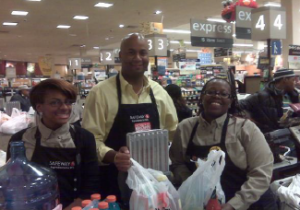 D.C. Councilmember Michael A. Brown will give away 600 backpacks filled with school supplies tonight, between 6-8 p.m. while supplies last. School starts Monday. The backpacks are strictly for District residents and will be distributed during the “Back to School Community Cookout.” The event, at 2845 Alabama Ave SE, will also feature food and entertainment. The protest at Chipotle was preceded by a march through Columbia Heights. Thirty-five people marched last week from a local church to the Columbia Heights Chipotle to protest how the restaurant chain fired 40 employees for allegedly lacking forms that prove they’re allowed to legally work in the U.S. According to the workers, when they returned from a 30-minute break, they found their replacements were already behind the counter. 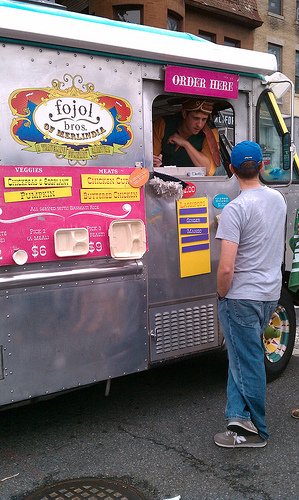 The workers allege that they were not offered any proper notice before or due compensation after the mass termination and “could not even have a lawyer, organizer, or any other person present in order to discuss their demands,” wrote Aaron Morrissey, at DCist. 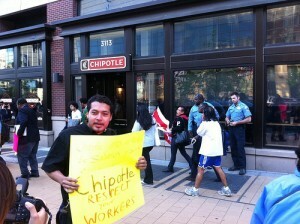 Fired Chipotle employee Miguel Bravo, demonstrating on 14th Street. “We are here to protest the bad treatment of workers. We were fired in a very unjust manner and we feel that’s another form of discrimination against the Latino workers of this place. After they fired us unjustly, they told us they were going to give us a severance payment of $2,000 and now they have refused to follow through with that promise and we are here to demand that they pay us,” Miguel Bravo, one of the workers said at the rally last week with the help of a translator. 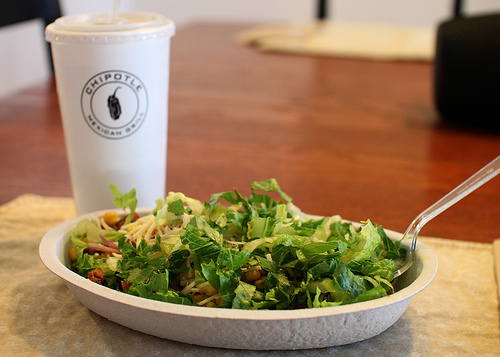 Chris Arnold, communications director of Chipotle, denied workers’ allegations that they were treated unfairly. He said the company is responsible for ensuring it is hiring employees without breaking the law. “The circumstances here relate to a group of about 40 employees, all of whom provided new documents to verify their work authorization status over the span of just a few days. All of those documents proved to be fraudulent. Under the law, we cannot employ any individual who is not legally authorized to work in this country. When we communicated this to the employees, most of them simply walked off the job, others were let go. But there was no mass firing during a break,” Arnold said. 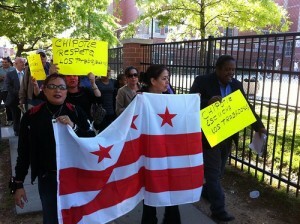 Heading to Columbia Heights to see the the latest protest against the firing of Chipotle workers. A coalition of leaders, activists, religious organizations and community groups in the Washington D.C. area will soon descend on Chipotle’s doorstep…They intend to gather at 5 pm at The Sacred Heart Church in Columbia Heights, at which point those in attendance will march to the store in a powerful expression of protest against the disgraceful actions of Chipotle Mexican Grill. According to the change.org article “On May 5th, (Cinco de Mayo, no less) fired workers will team up with everyday citizens to restore the inherent dignity and worth of all individuals in our communities”. Cinco de Mayo commemorates the Mexican army’s unlikely victory over the French at the Battle of Puebla on May 5, 1862. This will be the second protest for the workers at the Columbia Heights Chipotle who were allegedly fired over documentation issues. According to DCist.com, the workers said the firings occurred during a 30-minute break and when they came back from the meeting their replacements were already wrapping burritos. New allegations by the former employees say Chipotle hasn’t compensated them for back wages and won’t meet with City Council Members Jim Graham and Michael A. Brown, who marched for the workers in the first protest. Check back tomorrow for an update. A spiffy Lincoln Navigator. Not Brown's. Budget shortfall. Procuring a luxury SUV. Should a city suffering from the former do the latter? Too late– we already did. Twice. 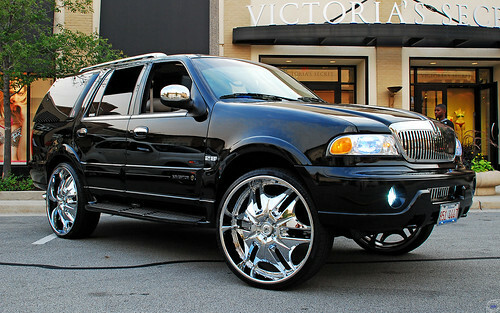 As mentioned in our morning roundup a few weeks ago, our Council Chair Kwame Brown– or someone acting on his behalf– required a top-of-the-line Lincoln SUV, complete with 600-watt sound system and DVD-entertainment, and it had to be here before the beginning of the year. In the Sunday Post, Mike DeBonis outlines exactly how a city with budget woes purchased one luxurious Lincoln for Brown, only to have it rejected for the trifling flaw of having a gray interior vs. the requested black one. A dealer from Coldwater, Michigan drove a second, more suitable SUV to D.C. to deliver it in time for Brown’s inauguration. Did I mention that the city isn’t exactly flush with cash right now? …when he was asked on television why taxpayers should foot the $1,900-a-month lease payments, Brown (D) said he had merely requested a black sport-utility vehicle and was driving the vehicle that the District had procured for him. The race for a D.C. council at-large seat is getting crowded. Wednesday, two more candidates threw their hats in the ring. The biggest challenge at this point for any of the candidates is getting on the ballot. Candidates have less than one month to pick up 3,000 signatures. No Social Security Number? No problem! At-large Councilman Phil Mendelson is introducing a bill Tuesday that will allow D.C. residents to get a drivers license without a Social Security number. 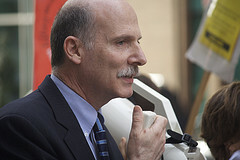 Mendelson said he decided to introduce the bill after hearing from residents who are “philosophically opposed” to having Social Security numbers, but are legal U.S. citizens. On Limiting Welfare in D.C. 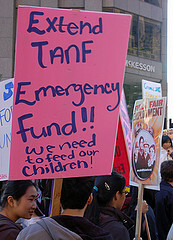 Instead of placing limits on welfare, the DC council should support the TANF Opportunities and Accountability Act of 2010 sponsored by Tommy Wells (Ward 6) and Michael Brown (at-large). The bill would invest in job training and educational programs as well as develop a better system to track welfare recipients in order to better understand when and why families enter and exit social programs. The welfare system is far from perfect, but as the District faces continued economic turmoil brought on by the recession, this is not the time to limit access to important social safety nets. District food banks, shelters, and other social services are already strained and woefully unprepared to face coming economic hardships as the economy tries to build itself back up. Families that have not been able to leave welfare are some of the most disadvantaged families without any means of support other than social programs. I use the trick in the image at right to keep track of wards. It’s simple: Starting with Ward One in the center of the city, drawing a clockwise spiral results in a line that goes through the wards in ascending order. 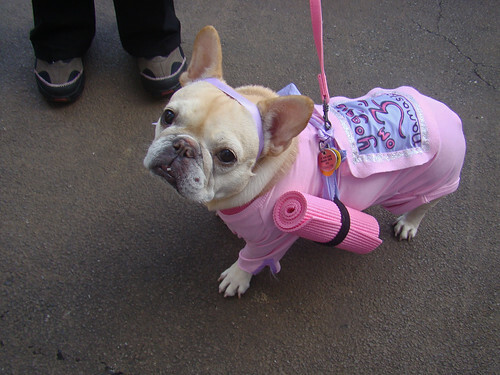 If you can remember the spiral, you can remember which ward is which. 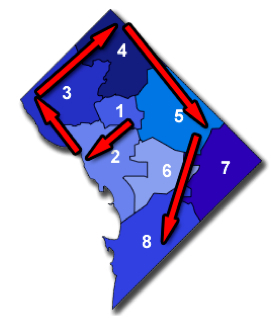 The District of Columbia is divided into eight wards and 37 Advisory Neighborhood Commissions (ANCs) within these wards. The total number of named neighborhoods is 127. I’m filing that away for trivia night.